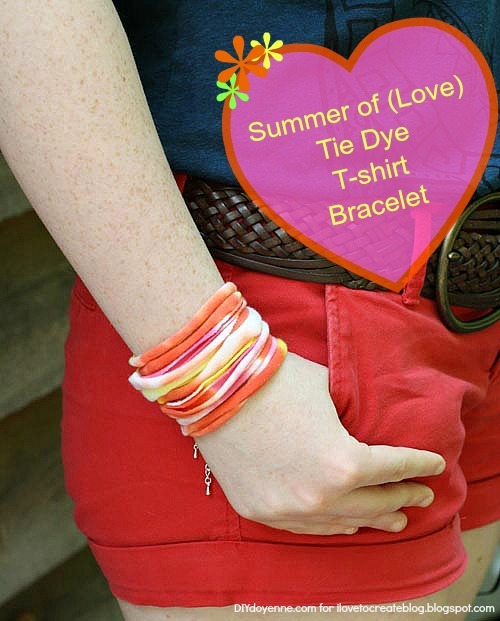 Tie Dye Your Summer is rolling on, and I've got a bracelet you can make in a flash with any tie dyed t-shirt! 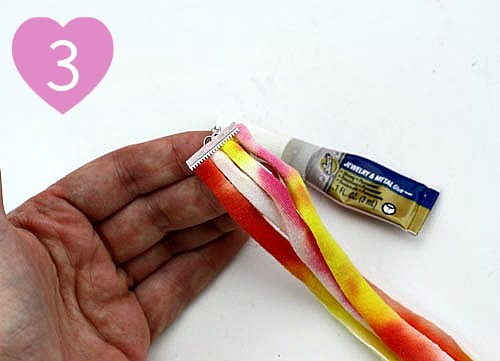 This is a perfect Summer Camp craft for teens. So easy to make and customize. 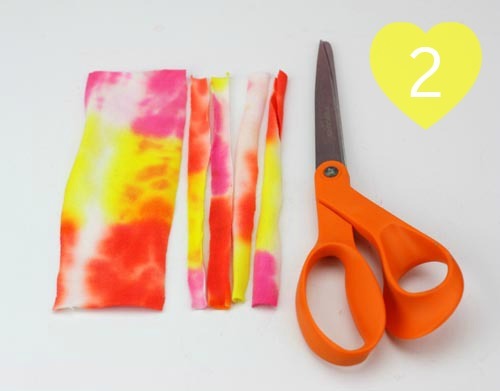 Tie dye a t-shirt, cut into strips, fold, glue and secure in fold over findings. That's it! It doesn't get much easier than that. 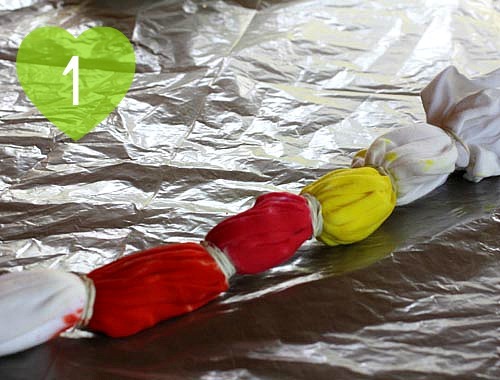 Tulip Tie Dyes are so easy to use, they're goof proof. Plus how delicious are these vibrant colors? Make an armful in a variety of colors and stack 'em up! Wash shirt first to remove sizing. Tie dye works best with natural fibers like cotton. Wet shirt. Use rubber bands to tie off shirt in banded sections. Add dye to sections. It's okay if this isn't perfect, trust me. I used neon yellow, pink and orange. Let dyed shirt set in plastic bag for 6-8 hours and wash and dry following instructions on package. Measure a section of fabric that is approximately 3" wide and long enough to wrap wrist. 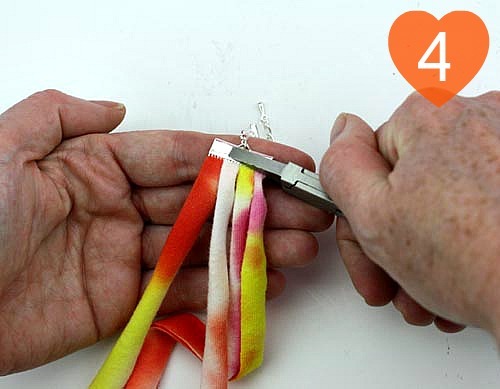 Your clasp adds about 1/2", so factor that in when measuring. Cut fabric into four even strips. Add a little glue along inside of metal finding. Fold each strip in half and line up between thumb and forefinger. Gently place in finding as shown. You want to be sure the fabric sections hit the top of the inside of the finding so they're secured when closed. Use flat nose pliers to compress finding over fabric. You have to squeeze this really hard, so don't be shy! Repeat for opposite side (try to keep the folds in the same direction on both sides) and allow the glue to dry overnight. These look best in groups, so make an armful! I'm showing a group of three in the photos! How would you style these bracelets? Do tell! 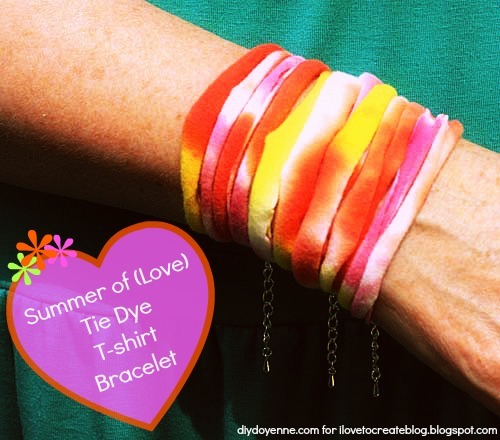 Visit Tie Dye Your Summer for tons of awesome DIY Tie Dye projects. Come see me at DIY Doyenne for more simply fabulous DIY fashion and style ideas. Hooray! I feel you, Susie!